I have no shame in admitting that I am often very motivated by what’s on sale in the butcher/seafood case when deciding what I’m going to be cooking for dinner. Finding little Manilla clams at the store today was a nice unexpected surprise because I’m burned out on roasts, hams, turkeys, mashed potatoes, any all other holiday type foods. 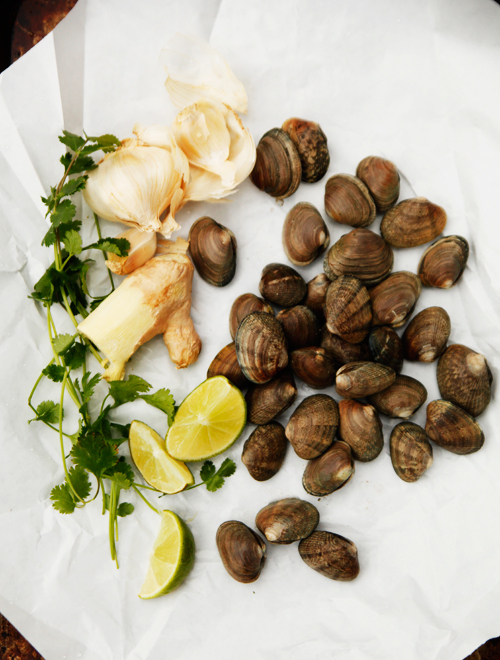 Usually when I buy clams I steam them in white wine, garlic, and lemon. But because it’s winter and the weather is very Seattleesque, I decided to spice things up by steaming the clams in a red curry, coconut and ginger stock. Hello, lover. The clams were gone within minutes of setting them on the table – I only had three of them before walking away to answer a phone call. When I returned to the table the guilty look on my husband’s face was all I needed to see to know there would be no more clams for me, even my 8 year old daughter was disapointed with her dad. All that remained in the serving bowl was a rich, flavorful, curry and ginger infused stock which I was more than happy to enjoy by the spoonful. There were no losers tonight. Asian ingredients succh as fish sauce, curry paste, and coconut milk can be found at your local Asian grocery store or online at places like Amazon.com. The broth itself is absolutely amazing! 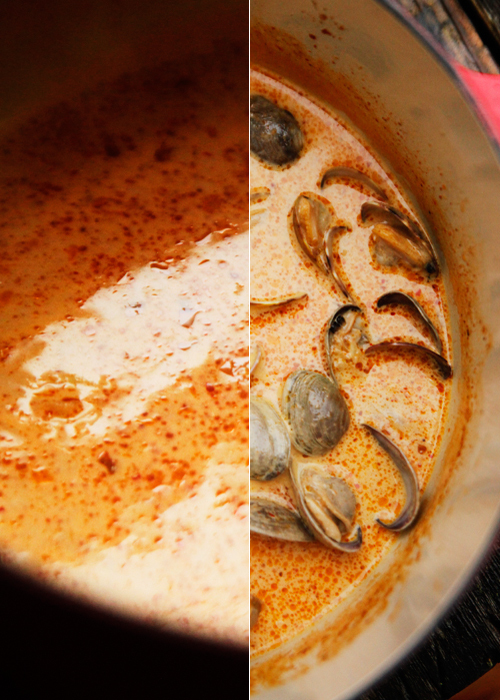 An Asian style steamed clam recipe featuring red curry, coconut milk, garlic, and ginger. Very flavorful and the right amount of spice. Add the garlic and ginger. Cook for 2-3 minutes until garlic is fragrant but not burned. Add the red curry paste and the fish sauce. Stir the paste until it has thinned out with the butter. Pour the chicken broth and coconut milk into the pot. Stir the broth mixture for a couple seconds until well mixed. Add the clams and cooked covered for 5-7 minutes, stirring occasionally, until clams have opened. Discard any clams that are still closed. Add the parsley and give the pot a quick stir. 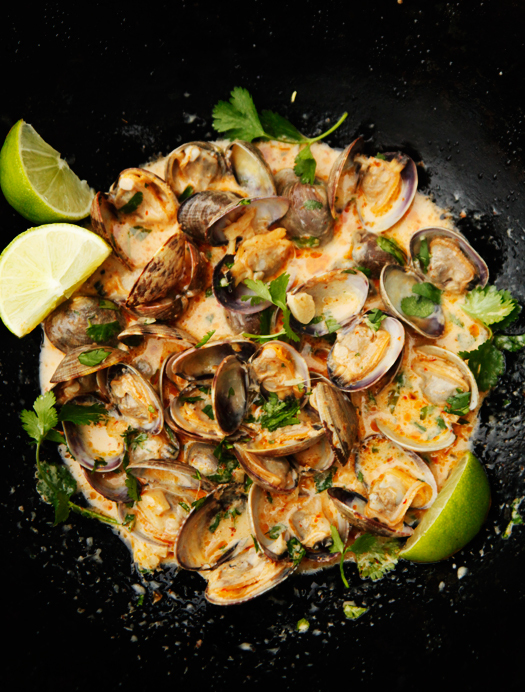 Transfer clams and broth to a large serving bowl and squeeze a tablespoon of fresh lime juice over the dish. Serve additional lime wedges on the site.Enjoy! Going to try this. But the ingredients list calls for cilantro and the directions say parsley. Which is it? Holy cow! 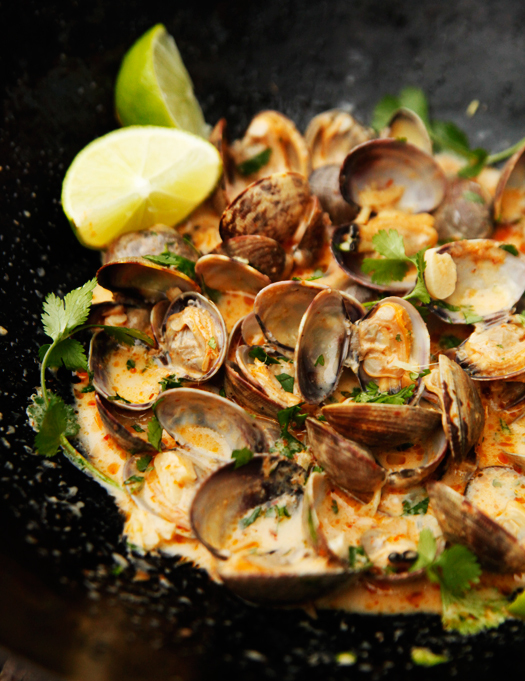 What an amazing, easy way to make clams! (I used mussels but whatever) The sauce is fantastic as previously reported. I threw in a little extra coconut milk and a dash of chipotle chili pepper and viola, people fighting over the bowl, broth, and crust bread. Thanks for sharing a great recipe! I have made this several times and I have to say it is so easy and amayyyyzing! I made this It was DELICIOUS ! I will be making it again thanx for sharing! Thank you, thank you, THANK YOU.. for saying this. I linked your recipe/site to a blog post that I did. I gave you credit of course.. but more importantly wanted to share it with you bc this post of yours meant so much to me. Went to Whistler, BC last February and had something very similar. I’ve wanted to recreate the recipe and this is it! Made my sweet husband very happy. Btw good crusty bread is a must…this broth is too yummy! Thank you! Okay, so I made these, with some modifications and while the recipe is good, some changes made it amazing. I doubled the coconut milk, added about a tablespoon of sugar, a few sprigs of cilantro and lime zest and juice from 1 lime into the broth while it cooked. I also added a chopped roasted long hot pepper that I happened to have left over. I also substituted mussels for the clams since they were on sale. The sweet heat made these mussels to die for. Had a tough crowd of foodies who were licking the bowls clean. 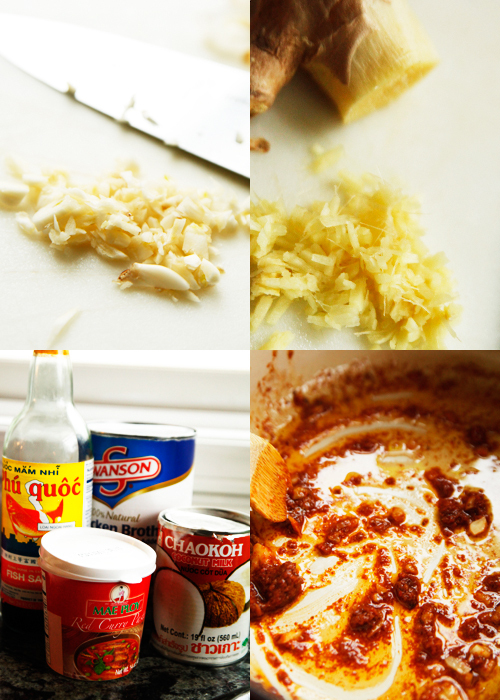 If you get a chance to try the recipe with these modifications, let me know what you think! Love the pics! Sounds great! What would you use to make it even spicier than this? Chili powder? Or is there something else better suited to add heat to this dish?